Hideki Shirakawa (白川 英樹 Shirakawa Hideki, born August 20, 1936) is a Japanese chemist, engineer, and Professor Emeritus at the University of Tsukuba and Zhejiang University. He is best known for his discovery of conductive polymers. He was co-recipient of the 2000 Nobel Prize in Chemistry jointly with Alan MacDiarmid and Alan Heeger. Hideki Shirakawa was born in Tokyo, Japan, in the family of a military doctor. He lived in Manchukuo and Taiwan during childhood. Around third grade, he moved to Takayama, Gifu, which is the hometown of his mother. Shirakawa graduated from Tokyo Institute of Technology (Tokyo Tech) with a bachelor's degree in chemical engineering in 1961, he also received doctorate from Tokyo Tech in 1966. Afterward, he obtained the post of assistant in Chemical Resources Laboratory at Tokyo Tech. While employed as an assistant at Tokyo Institute of Technology (Tokyo Tech) in Japan, Shirakawa developed polyacetylene, which has a metallic appearance. This result interested Alan MacDiarmid when MacDiarmid visited Tokyo Tech in 1975. In 1979, Shirakawa became an assistant professor in the University of Tsukuba, three years later, he advanced to a full professor. In 1991 he was appointed as Tsukuba's Chief of Science and Engineering Department of Graduate School (until March, 1993), and as Tsukuba's Chief of Category #3 group (until March, 1997). 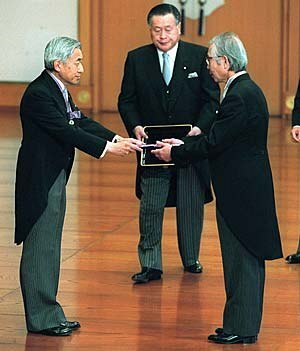 Shirakawa awarded the 2000 Nobel Prize in Chemistry together with UPenn's physics professor Alan J. Heeger and chemistry professor Alan G. MacDiarmid, "for the discovery and development of conductive polymers". He also became the first non-National Seven Universities graduate of Japanese Nobel laureates, and second Japanese chemistry Nobel laureates. Over the years, Shirakawa has been expressed that he doesn't want the Nobel Prizes to receive too much special treatment from mass media (especially the Japanese media). He hopes that many vital areas in fields outside the Nobel Prize categories will also become more widely known. "threatens the pacifist principles and fundamental human rights established by the constitution and should be rejected immediately...(omitted)...Even in difficult times, protecting the freedom of the press, of thought and expression and of academic research is indispensable." The year 2000 in science and technology involved some significant events. Alan Graham MacDiarmid, ONZ FRS (14 April 1927 – 7 February 2007) was a New Zealand-born American chemist, and one of three recipients of the Nobel Prize for Chemistry in 2000. Hideki (ひでき, ヒデキ) is a common masculine Japanese given name. The Nobel Prizes are awarded annually by the Royal Swedish Academy of Sciences, the Karolinska Institute, and the Norwegian Nobel Committee to individuals who make outstanding contributions in the fields of chemistry, physics, literature, peace, and physiology or medicine. They were established by the 1895 will of Alfred Nobel, which dictates that the awards should be administered by the Nobel Foundation. Another prize, the Nobel Memorial Prize in Economic Sciences, was established in 1968 by the Sveriges Riksbank, the central bank of Sweden, for contributors to the field of economics. Each prize is awarded by a separate committee; the Royal Swedish Academy of Sciences awards the Prizes in Physics, Chemistry, and Economics, the Karolinska Institute awards the Prize in Physiology or Medicine, and the Norwegian Nobel Committee awards the Prize in Peace. Each recipient receives a medal, a diploma and a cash prize that has varied throughout the years. In 1901, the winners of the first Nobel Prizes were given 150,782 SEK, which is equal to 7,731,004 SEK in December 2007. In 2008, the winners were awarded a prize amount of 10,000,000 SEK. The awards are presented in Stockholm in an annual ceremony on December 10, the anniversary of Nobel's death.As of 2015, there have been 28 laureates affiliated with the University of Pennsylvania, 6 alone in the last 10 years. The University of Pennsylvania considers laureates who attended the university as undergraduate students, graduate students or were members of the faculty as affiliated laureates. Otto Fritz Meyerhof, a research professor in physiological chemistry, was the first University of Pennsylvania laureate, winning the Nobel Prize in Chemistry in 1922. Two Nobel Prizes were shared by University of Pennsylvania laureates; Ragnar Granit and Haldan Keffer Hartline won the 1967 Nobel Prize in Chemistry, and Alan J. Heeger, Alan MacDiarmid and Hideki Shirakawa won the 2000 Nobel Prize in Chemistry. Three laureates, Christian B. Anfinsen, Gerald Edelman, and John Robert Schrieffer, won different Nobel Prizes in 1972, and were awarded an honorary Doctor of Science degree in 1973. Nine University of Pennsylvania laureates have won the Nobel Prize in Physiology or Medicine, more than any other category. This is a list of notable graduates and faculty members of the Tokyo Institute of Technology in Japan. Mrinal Thakur is a professor in the Department of Mechanical Engineering of Auburn University in Alabama, USA. He holds a series of patents on electrically conductive polymers. Thakur claims that the 2000 Nobel Prize in chemistry to Alan J. Heeger, Alan MacDiarmid and Hideki Shirakawa was awarded for a scientific result he disproved in 1988: that only conjugated polymers could conduct electricity. Polyacetylene (IUPAC name: polyethyne) usually refers to an organic polymer with the repeating unit (C2H2)n. The name refers to its conceptual construction from polymerization of acetylene to give a chain with repeating olefin groups. This compound is conceptually important, as the discovery of polyacetylene and its high conductivity upon doping helped to launch the field of organic conductive polymers. The high electrical conductivity discovered by Hideki Shirakawa, Alan Heeger, and Alan MacDiarmid for this polymer led to intense interest in the use of organic compounds in microelectronics (organic semiconductors). This discovery was recognized by the Nobel Prize in Chemistry in 2000. Early work in the field of polyacetylene research was aimed at using doped polymers as easily processable and lightweight "plastic metals". Despite the promise of this polymer in the field of conductive polymers, many of its properties such as instability to air and difficulty with processing have led to avoidance in commercial applications. Compounds called polyacetylenes also occur in nature, although in this context the term refers to polyynes, compounds containing multiple acetylene groups ("poly" meaning many), rather than to chains of olefin groups ("poly" meaning polymerization of). Polymer chemistry is a sub-discipline of chemistry that focuses on the chemical synthesis, structure, chemical and physical properties of polymers and macromolecules. The principles and methods used within polymer chemistry are also applicable through a wide range of other chemistry sub-disciplines like organic chemistry, analytical chemistry, and physical chemistry Many materials have polymeric structures, from fully inorganic metals and ceramics to DNA and other biological molecules, however, polymer chemistry is typically referred to in the context of synthetic, organic compositions. Synthetic polymers are ubiquitous in commercial materials and products in everyday use, commonly referred to as plastics, and rubbers, and are major components of composite materials. Polymer chemistry can also be included in the broader fields of polymer science or even nanotechnology, both of which can be described as encompassing polymer physics and polymer engineering. Polymer science or macromolecular science is a subfield of materials science concerned with polymers, primarily synthetic polymers such as plastics and elastomers. The field of polymer science includes researchers in multiple disciplines including chemistry, physics, and engineering. Polythiophenes (PTs) are polymerized thiophenes, a sulfur heterocycle. They are white solids with the formula (C4H2S)n for the parent PT. The rings are linked through the 2- and 5-positions. Poly(alkylthiophene)s have substituents at the 3- or 4-position. They are also white solids, but tend to be soluble in organic solvents. PTs become conductive when oxidized. The electrical conductivity results from the delocalization of electrons along the polymer backbone. Conductivity however is not the only interesting property resulting from electron delocalization. The optical properties of these materials respond to environmental stimuli, with dramatic color shifts in response to changes in solvent, temperature, applied potential, and binding to other molecules. Changes in both color and conductivity are induced by the same mechanism, twisting of the polymer backbone and disrupting conjugation, making conjugated polymers attractive as sensors that can provide a range of optical and electronic responses.The development of polythiophenes and related conductive organic polymers was recognized by the awarding of the 2000 Nobel Prize in Chemistry to Alan J. Heeger, Alan MacDiarmid, and Hideki Shirakawa "for the discovery and development of conductive polymers". Toshihide Maskawa (or Masukawa) (益川 敏英, Masukawa Toshihide, born February 7, 1940 in Nagoya, Japan) is a Japanese theoretical physicist known for his work on CP-violation who was awarded one quarter of the 2008 Nobel Prize in Physics "for the discovery of the origin of the broken symmetry which predicts the existence of at least three families of quarks in nature." Tsukuba (つくば市, Tsukuba-shi) is a city located in Ibaraki Prefecture, Japan. As of September 2015, the city had an estimated population of 223,151, and a population density of 787 persons per km². Its total area is 283.72 square kilometres (109.54 square miles). It is known as the location of the Tsukuba Science City (筑波研究学園都市, Tsukuba Kenkyū Gakuen Toshi), a planned science park developed in the 1960s. Yamazaki-Teiichi Prize is an award given annually by the Foundation for Promotion of Material Science and Technology of Japan (MST) to people who have achieved outstanding, creative results, with practical effect, by publishing theses, acquiring patents, or developing methods, technologies and the like and/or people with strong future potential for achieving such results. Chairman of the selection committee is Professor Hideki Shirakawa, the winner of the 2000 Nobel Prize in Chemistry. The prize was established in commemoration of the late Teiichi Yamazaki, the first chairman of the MST's Board of Directors, for his contributions to scientific, technological and industrial development and human resource cultivation.